If everyone was rewarded fairly for talent, creativity and pure hard bloody work, Dean Owens would be a very wealthy man. If the day job is being Dean Owens, singer-songwriter, the part-time jobs include his full band Whisky Hearts, his Deer Lake collaboration with Larry Lean, his Buffalo Blood project with Neilson Hubbard, production duties for Ameripolitan singer-songwriter Ags Connolly and the occasional project featuring covers or, more accurately, interpretations of other people’s songs (Johnny Cash for example). It’s fair to say that he doesn’t have a lot of downtime. With all of those projects simmering away, why not do something else to stave off boredom? So what’s next? What can we cram into that fifteen minutes of the day that’s left? Well, someone gave Dean a copy of Alan Lomax’s “The Book of American Folk Songs” and Dean, having a bit of down time, decided that it would be a great idea to give some of the lyrics new musical settings and record the resulting songs with Whisky Hearts fiddle player Amy Geddes and bass/piano player Kevin McGuire. Although the project was about creating new settings for existing lyrics, Dean and Amy managed to sneak a few of their own compositions, which fit perfectly with the originals. Amy’s “Amang the Braes O Gallowa” has the Celtic authenticity of early American folk tunes, while Dean’s “Take it Easy, but Take it” is a perfect lyrical fit with the Lomax collection. There’s even that very rare beast, a Dean Owens instrumental, “The Two Davies Waltz”. As a creative concept, it works perfectly. The minimalist arrangement of the songs (two voices, guitar and fiddle, with occasional piano and bass) works perfectly, Amy’s plaintive fiddle reinforcing the melancholy tone of the album while her vocal harmonies lighten the lyrical harshness that play such a large part in these folk ballads. The quality of the album’s so high that it’s difficult to pick favourites, but I loved “On the Range of the Buffalo” and “Rye Whiskey”. 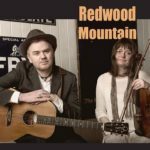 Redwood Mountain is a little gem of an album and it’s out now.